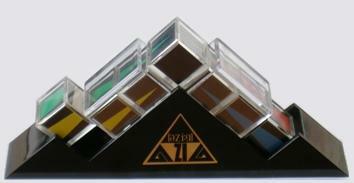 New Seven is a Japanese puzzle made by Kasawa. It is simply a frame containing seven tiles in a row. You place the tiles in any order into the frame and then try to put them back in order. The only moves you are allowed to do are lifting out the middle tile and sliding it into the row from either end. The tiles have pictures of an apple in them progressively being eaten up. The packaging also has drawings of a version which has a red cartoon crocodile on it. Azig by Central Hobby is another Japanese puzzle that extends this idea slightly. The base is an upright triangle, and the seven cubeshaped pieces lie on its slopes. The middle piece is at the apex, with three cubes resting on each slope. A move on this puzzle is to take out either one of the bottom cubes, causing the other cubes on that side to slide down, and placing it at the apex. This is essentially the reverse of a move on the New Seven puzzle. In the solved state six solid triangles should be visible on the sides of the puzzle. A cube can be reoriented during a move, so that makes it more difficult to figure out where each cube belongs. An extra set of inserts is provided so that the design on the cubes can be changed to show coloured dots instead of parts of triangles, making it more difficult to determine the orientations. The only English words in the packaging call this puzzle a "Comfortable Fullness Intellectual Puzzle". There are 7 tiles, giving 7! = 5040 possible positions. These are all solvable. In Azig the orientation of the cubes can be changed, so it is 247 times as many positions, which is 7!·247 = 23,115,815,976,960. It does have 4 solutions however - 2 essentially different ones that can be built in reverse order as well. I ran a computer search to find the number of positions at each distance from the solved position in the New Seven puzzle. The results are shown in the tables below. It shows that it can always be solved in at most 20 moves (12.069 on average). The extra column shows the results if the reverse ordering is also considered a solved position. In that case it can be solved in no more than 17 moves (11.015 on average). The two antipodes for the standard puzzle are 5674321 and 7654123. The four antipodes when reverse order is allowed are 3216745, 3412765, 5476123, 5672143. Let L denote putting the middle tile on the left of the row, and R denote putting it on the right. Bring tile 1 to the left side (locations 1, 2, or 3) if it isn't there already. This is easily done by bringing it to the middle with R moves and then doing L.
1. If tile 2 is on the left side then bring it to the middle with L moves. 2. If tile 2 is in the middle then do R to bring it to the right hand side. 3. Do L moves until tile 1 lies in location 3, directly to the left of centre. 4. Do R moves until tile 2 lies in the centre, next to tile 1. Put tiles 1 and 2 in their correct locations using L moves. 1. If tile 3 is in the middle then do R to bring it to the right hand side. 2. Do L so that tile 2 lies in location 3, directly to the left of centre. 3. Do R moves until tile 3 lies in the middle, next to tile 2. 4. Do L L L, putting tiles 1,2,3 in their correct locations. Put tile 7 in its correct location using R moves. The following image shows the internal numbering of the cubes. It will be solved if they are placed in this order, the left side with blue on top and green to the front, white on the back, and the right side with red on top, yellow on the front, orange on the back. The following solution method is very similar to the New Seven solution. Bring cube 3 to the left side and in the correct orientation (locations 1, 2, or 3). This is easily done by bringing it to the outside with R or L moves and placing it in the centre with the blue on top, green in front. Then do L to move it to the left. 1. If cube 2 is on the left side then bring it to the middle with L moves, orienting it with blue on top, green on the front. 2. If cube 2 is in the middle then do R to bring it to the right hand side. 3. Do L moves until cube 3 lies in location 1, at the bottom of the slope. 4. Do R moves until you can put cube 2 in the centre, orienting it with blue on top, green on the front. 5. Do L to put cubes 2 and 3 in their correct locations. 1. If cube 1 is in location 1, but wrongly oriented, then do L four times, orienting cube 1 during the first move so that blue is on top and green on the front. 2. If cube 1 is in the middle then do R to bring it to the right hand side. 3. Do L so that cube 2 lies in location 1, at the bottom of the slope. 4. Do R moves until you can place cube 1 in the middle, with the correct orientation. 5. Do L L L, putting cubes 1,2,3 in their correct locations. Put cube 5 in its correct location using R moves, oriented such that red is on top and yellow on the front. Remember to orient cubes during the R moves whenever necessary so that red is on top, and yellow on the front. The second solution has the cubes in the order 7254361 (or in reverse, 1634527). To reverse the order of the pieces, do: L R L R L R L.
To produce the second solution in Azig, do: LR RL RL LR RL RL LR.